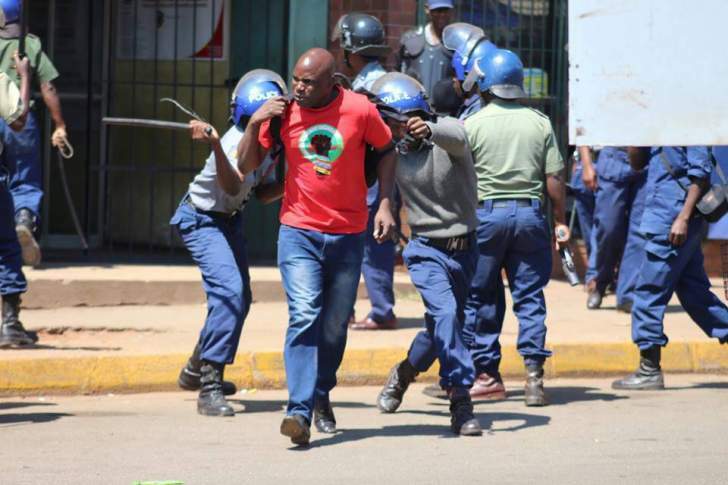 TWENTY-SEVEN leaders and members of Zimbabwe Congress of Trade Union (ZCTU) will spent the night in police custody after they were arrested by Zimbabwe Republic Police (ZRP) officers on Thursday and charged with disorderly conduct and committing public violence. In Harare, ZRP officers charged seven ZCTU leaders with disorderly conduct in a public place as defined in section 41 of the Criminal Law (Codification and Reform) Act. The seven leaders, who are represented by Kossam Ncube, Tinomuda Shoko and Gift Mtisi of Zimbabwe Lawyers for Human Rights (ZLHR) include ZCTU President Peter Mutasa, Secretary-General Japhet Moyo, Benice Maluleke, Priscilla Jonhi, Simon Mutasa and two leaders only identified as Chinovamari and Marmish. In Mutare, 20 ZCTU leaders and members, who are represented by Natsai Nyamwanza and Passmore Nyakureba of ZLHR, will spent the night in police custody after they were arrested and charged with participating in a gathering with intent to promote public violence, breaches of the peace or bigotry in contravention of section 37(1)(a) of the Criminal Law (Codification and Reform) Act. The 20 ZCTU leaders and members include Tenson Muchefa, Barbra Chivinge, Deliwe Munyongwa, Laina Sharare, Superior Boka, Stevene Chandakabata, Beatrice Kwendepi, Giles Maoneke, Justin Muonda, Arshford Mariga, Dickson Chaeruka, Elias Matanda, Jackson Mtisi, Portia Sibanda, Adam Nhamo, Regis Duri, Isaac Kapeni, Edison Nyambanje, Allen Chakabuda and Christine Mukolosa. In Masvingo, 12 ZCTU leaders and members, who were represented by Collen Maboke of ZLHR, were released after spending several hours in police detention. ZRP officers indicated that they would proceed by way of summons if they intend to prosecute the labour union members. The 12 include Elliot Meso, Agnes Hlanga, Kevin Mawoyo, Gilbert Sibanda, Tasara Dunia, Richard Munyenye, Davison Madzivire, Tamutswa Chikonyora, Peggie Rukawu, Stephen Madoyi, Chrispen Matipedza and Maxwell Madhunha. In Harare, ZLHR lawyers Lizwe Jamela, Obey Shava and Noble Chinhanu rescued 26 ZCTU staff and union members, who since morning had been illegally detained at their Gorlon House offices by ZRP officers after the arrest of the labour union's leaders in a pre-emptive strike to thwart an anti-government protest organised to protest against government's disastrous economic policies. Meanwhile, Harare Magistrate Lanzini Ncube on Thursday 11 October 2018 dismissed an application filed by Chinhanu seeking to overturn the ZRP ban of ZCTU's anti-government protest. In dismissing the ZCTU application, Ncube cited the current cholera outbreak and stated that the labour union's protest could turn violent as there is discontentment among citizens over the current economic situation.